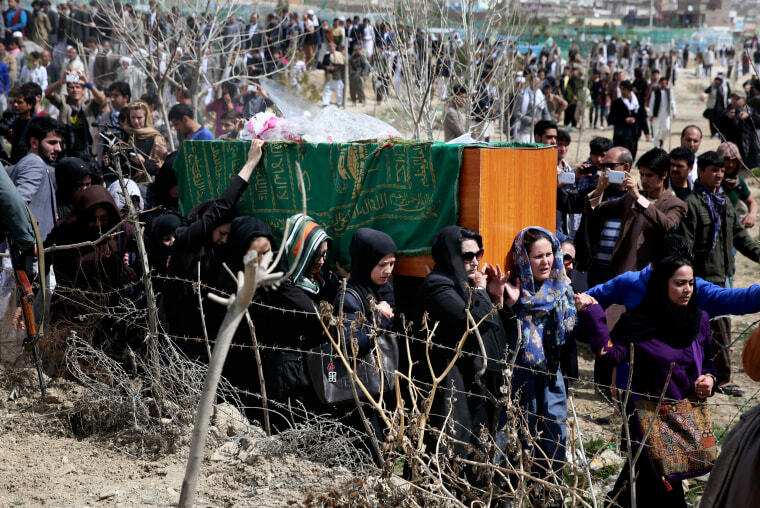 KABUL, Afghanistan — An Afghan woman who was beaten to death by a mob was buried in Kabul on Sunday, her coffin carried aloft by women's rights activists. Hundreds of people gathered in northern Kabul for the funeral of 27-year-old Farkhunda, who like many Afghans is known by only one name. She was killed late Thursday by a mob of mostly men who beat her, set her body on fire and then threw it into the Kabul River, according to police accounts. Officials and eyewitnesses told NBC News that she was set upon after burning copies of the Quran, but at her graveside, the head of the Interior Ministry's criminal investigation directorate, Gen. Mohammad Zahir, said no evidence had been found to support those allegations. "We have reviewed all the evidence and have been unable to find any single iota of evidence to support claims that she had burned a Quran," Zahir said. "She is completely innocent." He said that 13 people had been arrested in connection with her killing. President Ashraf Ghani condemned Farkhunda's killing as a "heinous attack" and ordered an investigation. Following allegations that police stood by and did nothing to stop the fatal attack, Ghani said it revealed "a fundamental issue" — the country's police were too focused on the fight against the Taliban insurgency to concentrate on community policing. His comments followed widespread condemnation of the killing. In Afghanistan, women are generally treated as inferior, despite constitutional guarantees of equality. Violence against women often goes unpunished.